Direct embroidery adds that extra touch to a team or business look. On hats, jackets, shirts, coats & uniforms. 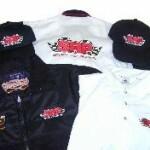 Digitizing & embroidery is all done in house for best quality. Click on the embroidery picture to see just some of the things you can order in to have embroidered. Click on the next picture for all types of different caps to choose from.